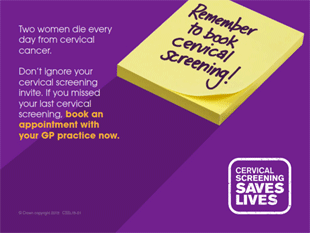 Health organisations in Hounslow want you to come in for your cervical screen. If you are aged 25 to 64, you will receive a letter every three or five years (depending on your age) reminding you to book your test. Being screened takes about five minutes and can be organised at a GP at a time that suits you. Seventy five percent of women already attend their test, but we want to reach the last 25 per cent and encourage them to respond to their screening letter. A new campaign by Public Health England has been launched to raise awareness of the risks of cervical cancer and to highlight the benefits of screening, reminding women that cervical screening can stop cancer before it starts. Hounslow Council and CCG are supporting this campaign to encourage local women aged 25 to 64 to respond to their screening letter and make an appointment. A cervical screen or a ‘smear test’ is a free health test for women that helps to protect against the risk of cervical cancer. The test involves attending a doctor’s surgery when invited and being examined by a health professional. However, cervical screening is at a 20-year low, with one in four women in the UK not attending their test. Around 2,600 women are diagnosed with cervical cancer in England each year and around 690 women die from the disease, the equivalent of two women every day. It is estimated that if everyone attended screening regularly, 83 per cent of cervical cancer cases could be prevented. The campaign will raise awareness of the risks of cervical cancer and highlight the preventative benefits of screening; encouraging women to respond to their screening invitation letters, and if they missed previous invites to book an appointment. The campaign also aims to tackle a number of the identified barriers to screening, including; concern that it might be painful and embarrassing. Councillor Katherine Dunne, Cabinet Member for Communities and Workforce, Hounslow Council, said: “Screening allows for the detection of cervical cancer at an early stage and the programme is estimated to save 4,500 lives every year. Dr Richard Baxter, CCG clinical lead for cancer, said: “Cervical screening saves lives through early detection and treatment, sometimes before the changes have even become cancer but usually before they have spread beyond your cervix.